When the doors are locked using one of the following methods, the doors cannot be opened using the inside or outside door handles. The doors must be unlocked to open the doors. Always have the doors locked while driving. Along with the use of seat belts, this provides greater safety in the event of an accident by helping to prevent persons from being thrown from the vehicle. This also helps keep children and others from unintentionally opening the doors, and will help keep out intruders. Before opening any door, always look for and avoid oncoming traffic. Do not leave children unattended inside the vehicle. They could unknowingly activate switches or controls. Unattended children could become involved in serious accidents. To lock a door, turn the key toward the front of the vehicle 1 . To unlock, turn the key toward the rear 2 . The power door lock system allows you to lock or unlock all doors at the same time. Turning the key toward the front 1 of the vehicle locks all doors. Turning the key one time toward the rear 2 of the vehicle unlocks that door. From that position, returning the key to neutral 3 (where the key can only be removed and inserted) and turning it toward the rear again 4 within 5 seconds unlocks all doors. The driver’s door key operation allows you to open and close windows equipped with automatic operation at the same time. To open the windows, turn the driver’s door key toward the rear of the vehicle for longer than 1 second after the door is unlocked. To close the windows, turn the driver’s door key toward the front of the vehicle for longer than 1 second after the door is locked. Windows stop when the key cylinder is released. NOTE: When the window lock button is pressed the key will not operate the window open or close function. To lock the door without the key, move the inside lock knob to the lock position 1 , then close the door. To unlock the door without the key, move the inside lock knob to the unlock position 2 . To lock all the doors without a key, push the door lock switch (driver’s or front passenger’s side) to the lock position 1 . When locking the door this way, be certain not to leave the key inside the vehicle. To unlock all the doors without a key, push the door lock switch (driver’s or front passenger’s side) to the unlock position 2 . When the power door lock switch is moved to the lock position and any door is open, all doors will lock and unlock automatically. With the Intelligent Key left in the vehicle and any door open, all doors will unlock automatically and a chime will sound after the door is closed. These functions help to prevent the Intelligent Key from being accidentally locked inside the vehicle. All doors lock automatically when the vehicle speed reaches 15 MPH (24 km/h). 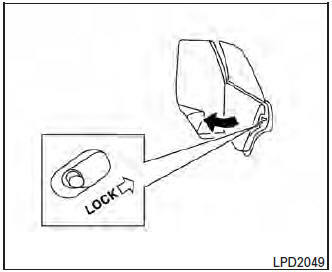 All doors unlock automatically when the ignition switch is placed in the OFF position (models with Intelligent Key system) or when the key is removed from the ignition switch (models without Intelligent Key system). Place the ignition switch in the ON position. Within 20 seconds of performing Step 2, push and hold the power door lock switch to the position (UNLOCK) for more than five seconds. When activated, the hazard indicator will flash twice. When deactivated, the hazard indicator will flash once. 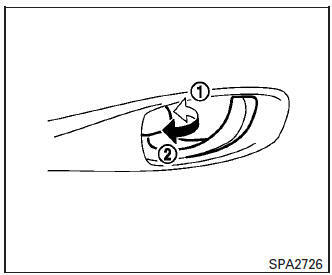 The ignition switch must be placed in the OFF and ON position again between each setting change. When the automatic door unlock system is deactivated, the doors do not unlock when the ignition switch is placed in the OFF position (models with Intelligent Key system) or when the key is removed from the ignition switch (models without Intelligent Key system). To unlock the door manually, use the inside lock knob or the power door lock switch (driver’s or front passenger’s side). Child safety locks help prevent the rear doors from being opened accidentally, especially when small children are in the vehicle. The child safety lock levers are located on the edge of the rear doors. 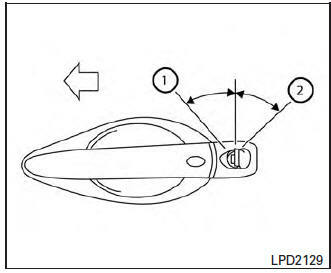 When the lever is in the LOCK position, the door can be opened only from the outside.